Synonyms: Morus cuspidata, Morus laevigata, Morus. wallichiana . There are many types of mulberries bearing quality edible fruits growing in different parts of the world. This mulberry is native to the Himalayan Mountains of China. 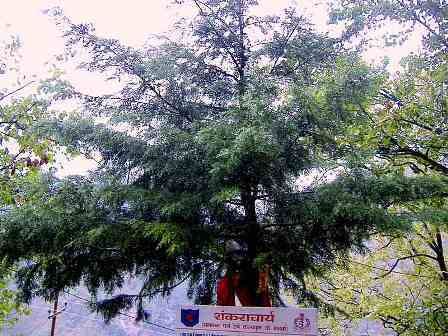 But it also grows in the Eastern Himalayan region of India and Bhutan. Besides these areas, it is also reported to grow in Thailand, Myanmar, Malaysia etc. Himalayan mulberry most probably originated somewhere in the Himalayan mountains of China. The trees of this fruit are known to be very long lived and can fruit for several hundred years. Small to medium trees 7-12 m tall, dioecious, branchlets pubescent when young. Winter buds ovoid-ellipsoid to ovoid, white pubescent;stipules small, petiole 2-4 cm; leaf blade ovate to broadly ovate, 5-15 × 5-9 cm, membranous, abaxially pale green and with short soft hairs along midvein and lateral veins when young, adaxially dark green and with soft hairs along veins, base rounded, ± cordate, or truncate, margin minutely and densely serrate, apex acuminate to shortly acuminate; secondary veins 4-6 on each side of midvein. Male catkins axillary, paired, 4-8 cm; peduncle 1-1.5 cm; female inflorescences cylindric, 6-12 cm; peduncle 1-1.5 cm; male flowers: calyx lobes ovate, adaxially pubescent; filament ca. 2.5 mm; anther globose; female flowers: calyx lobes pubescent; ovary ovoid, declinate, ± compressed, pubescent; style absent; stigma 2-branched, papillate. Fruit a syncarp, yellowish white when mature, 6-12 cm; achenes ovoid. Fruits are eaten fresh or can be used just like any berry. These are tasty. The juice of the bark is applied to cuts and wounds. The tree is used for paper making. A fibre is obtained from bark. A colour is distilled from the wood and leaves. The wood is hard, close grained with a beautiful lustre. It is therefore used for furniture, construction etc. Himalayan mulberry trees are hardy to about upto -10 C. These are fairly adaptable, but grow well in deep, moist soils. Fertilization is generally unnecessary. Grow in full sun. Mildly drought tolerant, but water should be provided during long dry spells. 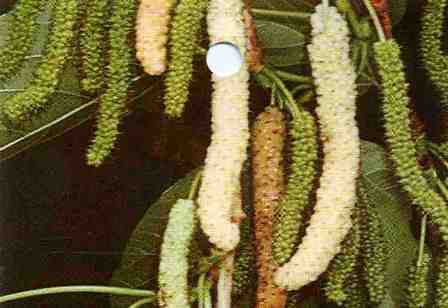 The Himalayan Mulberry is fairly similar in growth habits and climatic requirements to the black mulberry. Propagation is usually by seed, which can take several years to bear. Seeds will benefit from a few weeks to 2-3 months of cold stratification. Seeds can germinate within a few weeks to several months. Cuttings and layering also work in this plant. This fruit seems to prefer light (sandy), medium (loamy) and heavy (clay) soils which should, however, be well drained. Any pruning should only be carried out in the winter when the plant is fully dormant because mulberries bleed badly when cut. Ideally prune only badly placed branches and dead wood.